TSC is proud to announce the success of our fresh program the ‘Tabloid Experience’ in Term 1, 2013. The Tabloid Experience incorporates the best activities from our Tabloid Sports Carnival, Teamwork and Technology Sessions and usually runs for 3.5 hours. One of the most important features of this program is that teachers do not need to run a particular activity station; we bring enough Consultants to run and marshal the entire event. The cost of the Tabloid Experience is $6.50 per head + GST, with the program currently available to schools in Melbourne. If you would like to know more about the Tabloid Experience, please call TSC on 03 9754 8466. Prev:TSC in 2013 – Term 4 Booking Out! Next:Tabloid is now Educational Sports Carnivals! 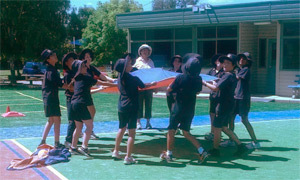 Alex is a Victorian-based ESC consultant who loves seeing children involved in sporting programs. He has worked in the sports industry for a number of years and has played and coached several sports.